See other news releases, Showcasing the DNR stories, photos and other resources at michigan.gov/dnrpressroom. PHOTO FOLDER: Larger, higher-res versions of the images used below, and additional ones, are available in this folder. Ready for a new day-after-Thanksgiving tradition? How about fresh air, time with family and friends, and a healthy dose of the great outdoors! 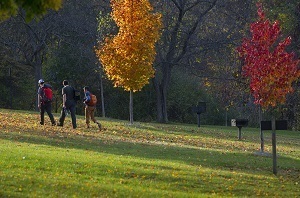 #OptOutside on Black Friday, and enjoy free admission to Michigan state parks all day long. The #OptOutside movement – started in 2015 by outdoor recreation cooperative REI Inc. – encourages people to spend more time outside and highlights the health and well-being benefits of being outdoors. Hundreds of agencies across the country, including the DNR, have joined the movement. On Friday, Nov. 23, burn those Thanksgiving calories, recover from shopping excursions and explore some of the state’s best outdoor destinations. To help you #OptOutside, the DNR is waiving the regular Recreation Passport entrance fee that permits vehicle access to Michigan state parks, trails and boating access sites, though other permit and license fees still apply. Hike, bike, snowshoe, cross-county ski or ride some of the more than 12,500 miles of state-designated trails. Cast a line and experience some of the best fall fishing around. Mountain or fat-tire bike across rugged terrain or pedal a paved trail. Find a new hunting spot by exploring one of Michigan's recreation or state game areas or state forest lands. Enjoy the peace and quiet of camping or staying in a rustic cabin in the off-season. Seek out Michigan’s backstory and visit a historic site. Visit michigan.gov/dnr to learn more about camping, fishing, hunting and other outdoor exploring opportunities. For more on #OptOutside at state parks, contact Ron Olson at 517-243-1477. We’re just a few days into Michigan’s firearm deer season, and while all hunters are hoping for a successful outing, the DNR is most concerned about everyone having a safe outing. While there have been several hunting-related incidents reported so far this season, it’s important to keep in mind safe hunting practices. Check out three brief videos with tips from DNR conservation officers on wearing hunter orange, avoiding trespassing on private property, handling firearms and using tree stands. All three videos are available at michigan.gov/huntereducation. For more information, contact Katie Gervasi at 517-290-0679. DNR staffer Mike Smalligan, whose work includes helping private landowners, getting more young people into the woods and promoting the ways that forests provide clean water, recently was named Forester of the Year by Michigan’s chapter of the Society of American Foresters. 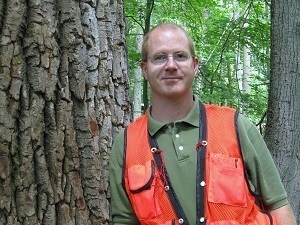 Smalligan, who has been with the DNR’s Forest Resources Division since 2014, coordinates the Forest Stewardship Program, which connects landowners with foresters to help them manage their woods. He created Wheels to Woods in 2016, which has paid the transportation costs for 28,000 K-12 students to take field trips to nearby forests; has initiated Forests for Fish, which brings loggers, foresters and fisheries biologists together to improve water conditions in Michigan’s forests; and has been instrumental in securing grant funding for a variety of projects. Smalligan is active with the American Tree Farm System, a certification program for family forest owners, and won its national leadership award in 2017. Learn more about these programs and the DNR’s forest-related activities at michigan.gov/forestry. For more information, contact Kathleen Lavey at 517-284-5852. Talk of trees in the fall usually centers on the changing leaves and where to see peak fall color displays. 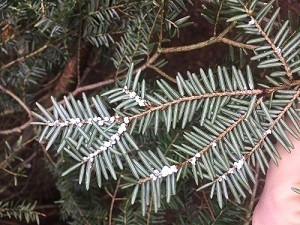 Right now, though, the DNR is encouraging Michigan residents to pay extra attention to something that's not so nice for trees: hemlock woolly adelgid – tiny, invasive, aphid-like insects from Asia that consume a hemlock tree's stored nutrients, slowly sucking the life from the tree. These forest pests are waking up from their summer sleep to begin feeding on hemlocks; their presence already has been confirmed in Allegan, Muskegon, Oceana and Ottawa counties. In case you missed it, earlier this month we ran a story on this invasive pest, including tips on identifying, finding and reporting hemlock woolly adelgid. Learn more at michigan.gov/HWA. Did you know Michigan is home to tens of thousands of cold, quality trout streams? If you're ready to hit the water, start with our Trout Trails app. It has detailed site descriptions, species info, regulations & more. It's not too early to start thinking about holiday gift giving. Consider state park and harbor gift cards or eLicense gift certificates; these could be the perfect stocking stuffers for all of the outdoor enthusiasts on your shopping list! Want to do your part to help keep Michigan's lakes, forests and other outdoor resources healthy? Get familiar with the invasive species that threaten our natural resources, and report any sightings as soon as possible.